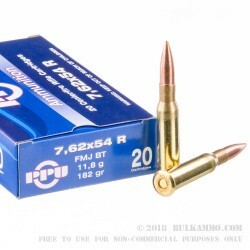 This 7.62×54mmR cartridge by Prvi Partizan features a 182 grain projectile that’s perfect for long days of target shooting. The bullet’s full metal jacket will save your bore from lead fouling, letting you stay on target for much longer in between Hoppe’s sessions. Its boat tail stabilizes its flight and improves its ballistic coefficient, giving it almost surgical precision at long ranges. What’s more, the ease this bullet’s shape provides during assembly means its that much less likely to have occurred the kind of dings that would have impacted its accuracy. With its non-corrosive Boxer primed brass casing, this cartridge is poised to offer you a lot of shooting pleasure -- and with 500 to handload multiple times, we’d be surprised to see you order another shipment of these tidy rounds soon. These cartridges are manufactured in Serbia, which adds an extra air of authenticity if you’re going to load it into a tried and true Soviet workhorse rifle. 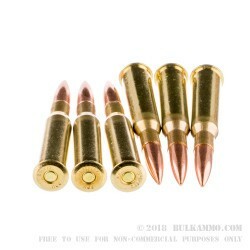 Q: Are these rounds non-corrosive? A: These Prvi Partizan rounds are non-corrosive. 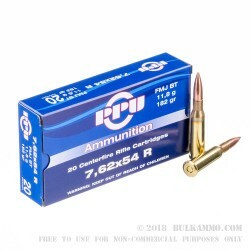 Prvi is a well-known manufacturer out of Serbia and have a solid reputation for rounds that are consistent and reliable. If you have any other questions, please just let us know and we'll work to get you accurate answers.